ECU Joondalup have bounced back from their local derby defeat against Sorrento with a clinical display in a 4-0 win against Cockburn City at Dalmatinac Park, in week 7 of the PS4 National Premier League WA. The home side squandered a chance after only three minutes, after Liam Murray’s penalty was well saved by Fraser Greenwood (right), who went on to have an outstanding game. Gordon Smith gave the Jacks the lead with a well-taken goal early, and he added a second mid-way through the second half. James Owen came off the bench to score his first goal in the senior team, and Ben Johns wrapped up the scoring with a great individual goal two minutes from time. 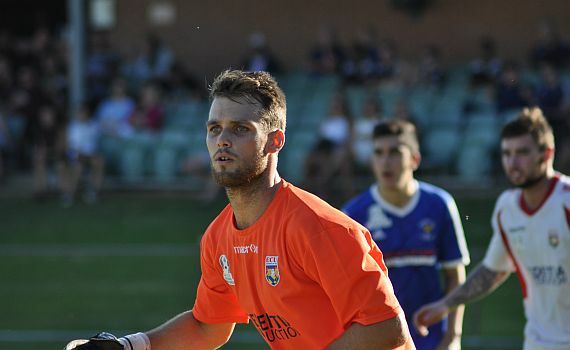 Click here to hear Head Coach Dale McCulloch and keeper Fraser Greenwood’s views of the big win. It was an injury-depleted Jacks side that took the field against the Cockerels. Ross Millard, Tommy Amphlett, Nathan Diaz, Jack Jones were all missing, and the coach brought in Ben Johns, Sam Pollard and Logan McIsaac to the starting line-up, while James Owen, Keylun Pollard and Stefan Vranesevic were on the bench. The Jacks hadn’t won at Dalmatinac Park for three season in the league, but did beat them in the Night Series earlier in the season. Cockburn went into the game in fourth spot, and had the chance to take the lead after only three minutes. A under hit back pass from Johns was pounced on by Murray, and the striker was clipped by Shane Pickering in the penalty area and referee Stuart Muldoon pointed straight to the spot. Murray picked himself up and took the resulting penalty, but Greenwood guessed the right way to palm it away and it was cleared by Johns. After that let off the Jacks settled, with Steven McGarry shot from the edge of the box saved by Luke Radonich, before Sam Pollard shot was well saved by the Cockburn custodian. Radonich then produced a stunning save to deny skipper Jon Huggins on 24 minutes, but there was little the keeper could do when ECU opened the scoring four minutes later. It was a great start for the Jacks, but conceding the goal seemed to wake Cockburn up, and they ended the half well. Calvin Whitney’s shot crashed off the crossbar, before Cameron Edwards’ shot was tipped over the top by the alert Greenwood moments later, but at the break we led 1-0. It was a great first half from the side, with the new players fitting in well, while the experience of Smith, McGarry, Higgins, Pickering and Kevin Moon – it was solid first half. The Jacks were out of the blocks early in the second and Radonich saved well to thwart Smith early, before the keeper produced a great save to deny Logan McIsaac, after a great team move down the right. Smith was a constant threat, holding the ball up well and bringing other into the game, while Moon, McGarry and Higgins began to get a hold in the middle of the park. Their good start to the second period was rewarded on 69 minutes, when they doubled their advantage. Daryl Nicol found space down the left and cut inside his marker, his deep cross picked out the unmarked Smith at the back post who headed home for his third goal of the season. Things got better for the Jacks and they added a third eight minutes later. Smith sent in substitute Owen down the right of the penalty area and the youngster kept his composer and finished clinically, much to delight of the players and bench. The game wasn’t over and Cockburn continued to press, and Greenwood produced two great saves to deny Aden Da Luz and Whitney late on, the keeper looked determined to keep his first clean sheet in the league for the Jacks. But the icing was put on the cake two minutes from time, when the Jacks scored their fourth, and what a goal it was. Johns picked the ball up just inside the Cockburn half and raced at the Cockburn defence weaving in and out of tackles, before racing into the penalty area and finishing with aplomb, for one of the best individuals goals of the season. It capped off a fantastic performance from the side, and a much needed win move the Jacks up to eight place on seven points, only four points outside the top four. In other results an unmanned under 20’s were beaten 3-0 by Cockburn, while a young 18’s side were edged out 3-2, in an improved performance from the side. We are back at the ECU Football Stadium next week when we take on the rejuvenated Subiaco – I’ll see you there!! !